30 Day Subscription to DigiTran Pro. Full use of the program for 30 days. Please see full product for product features. Support via the AudioScribe Forum and E‐mail with Access to AudioScribe Online Educational Videos. Make that Plus for $75 more and receive 2 incidents of support or online training during that month. Ask about our free 30 day evaluation! The Subscription is a wonderful opportunity to utilize our software without the commitment of a large purchase. This is the perfect tool for a student or a working reporter who has not yet used speech recognition and might not be sure that they are up to the challenge. 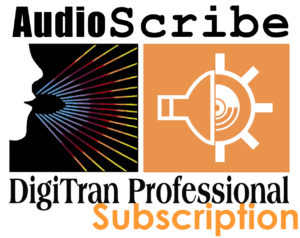 AudioScribe offers subscription options for all of its products which allows you to utilize the FULL software for 30 days at an extremely reasonable price. How long can you utilize the Subscription service? You can use the subscription service for as long as you renew your monthly subscription. Do I ever own a license of the software when using the subscription? The $100 monthly fee is a non-refundable usage fee, however, at any time you may choose to purchase the program and have all of the money that you paid applied to the purchase. In order to own the license you would have to continuously subscribe for a certain amount of months (depending on the software you choose). If you want to pay more each month to pay it off faster, you can do that as well! Are there any limitations on the software with the subscription service? There are NO limitations to the software, you have FULL access to all features are as long as you are subscribed. Does the subscription come with support and/or training? When you first start the Subscription, AudioScribe will provide you with one free hour of online assistance to get you started. This must be scheduled in advance. The Subscription includes only email support. You may, however choose to purchase two incidents of support or training at the discounted rate of $75 at the time of subscription which would give you two hours of support or training during that 30 days.